Nonprofit sectors account for a small but significant share of most major economies globally, and the marketing and fundraising activities of organisations operating in this sector are of increasing interest to researchers around the world. Although nonprofit marketing covers many activities not directly concerned with fundraising, the acquisition of funds is the primary objective of most nonprofit marketing work. 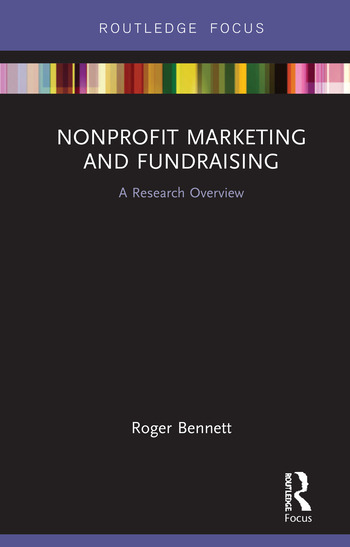 Nonprofit Marketing and Fundraising provides a concise introduction to the latest research in the nonprofit marketing and fundraising field, reviews current controversies, outlines the major theories and models of fundraising, and presents suggestions for future research. The text guides the reader through the myriad of research undertaken on nonprofit marketing and fundraising, summarises important findings and key thinking on fundraising strategies and processes, offers conceptual insights into emerging themes and emphasises recent advancements in digital fundraising. issues connected with the questions ‘why people donate’ and ‘what characteristics describe the "giving type"’? charity advertising (including criticisms of its use) and the branding of nonprofit organisations. This shortform book provides a useful overview for advanced students and scholars moving into the field. 1. Introduction; 2. Frameworks and foundations; 3. Fundraising in theory and practice; 4. Fundraising today and tomorrow; 5. Conclusion, reflections, and opportunities for future research. Dr Roger Bennett is a Professor of Marketing at Kingston Business School. His main research interests lie in the fields of nonprofit marketing and advertising. Roger is the author of many books and numerous journal articles in the fields of business management and marketing.